Rio is Happy Feet's Brazilian cousin – a computer-animated musical spectacular that incorporates environmentalist themes. Substitute the arctic penguins for coloured feathered friends and sit back as some of these clever avians re-define the term, 'bird-brain,' outsmarting both monkeys and human beings. Blu is an orphaned male blue macaw (Jesse Eisenberg). Under the care of a shy bookstore owner, Linda (Leslie Mann), he is domesticated to an almost human level. This 'nerd bird' reads the paper, can type on the computer and drinks hot chocolate with marshmallows and thrives on the general comforts of the warm indoors. Who needs to fly when you can walk, climb and theorise about iFlight Fundamentals? There's a slight problem, though: Blu is the last of his species and, in the name of conservation, he is to mate with the remaining female of his kind, Jewel (Anne Hathaway) on the behest of an eccentric ornithologist, Tulio (Rodrigo Santoro). Jewel, however, is more concerned with escaping her veterinary prison than saving her species. And things don't get any easier when exploitative bird-nappers are thrown into the plot. The stellar cast of voice actors do not fail to amuse. Eisenberg may be tiresomely pigeonholed as the gauche young male but, as Blu, he gets away with it. Hathaway effortlessly reprises her Agent 99-esque aloofness as Jewel; while 30 Rock's Tracy Morgan is able to make a drooling bulldog, Luiz, look oh so adorable and cuddly. Jemaine Clement, from the musical comedy duo Flight of the Conchords, is menacing as the voice of Nigel, the villainous cockatoo. His solo number is hilarious, especially when he breaks into rap: 'Like an abandoned school I have no principles.' Music supervisor, Sergio Mendes, collaborates with will.i.am, once again, to produce a deliciously assorted soundtrack: you'll hear a re-vamped version of Mendes' own signature song, 'Mas Que Nada,' along with some new contributions from the likes of Taio Cruz, multi-instrumentalist Carlinhos Brown and bossa nova star Bebel Gilberto. Music lovers will be glad to know that the film immediately erupts into song and dance within the first two minutes. By far, the catchiest tune has got to be 'Take You To Rio' by Ester Dean: 'Lemme take you to Rio, Rio. Fly o'er da ocean like an eagle, eagleâ€¦Na na na.' The animation and visual-effects teams also did an amazing job. The textural details of the feathers and beaks of the macaws, during their close-ups, are impressive. 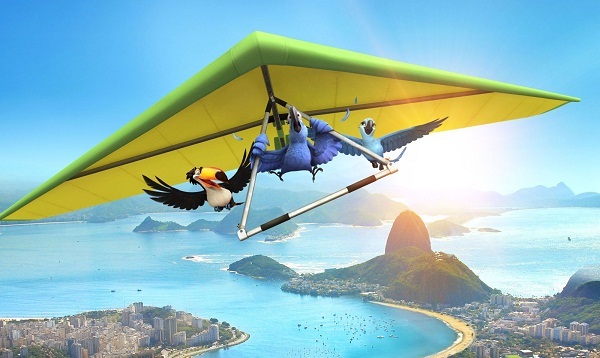 Also, with those 3D glasses, you will be fooled into experiencing breathtaking flight as the macaws soar over cliffs on hang-gliders. One aspect of the film that leaves a sour taste, however, is the over-familiar plot – animal X gets caught by human, animal X makes some more animal friends, animal X finds its way back to loved one. Finding Nemo anyone? 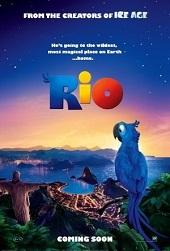 Still, Rio is a excellent comical adventure film that exudes family-friendly fun, bound to satisfy both children and grown-ups, though given its mixture of colourful cast, it's disappointing that only a few characters will leave a memorable impression on viewers. Nevertheless, if your children or younger relatives are begging you to take them to Rio, Rio, you won't regret letting them win this time 'round.